As part of the continuing activity in support of the new Prius, Toyota have created a 'floralscape' in downtown Los Angeles. 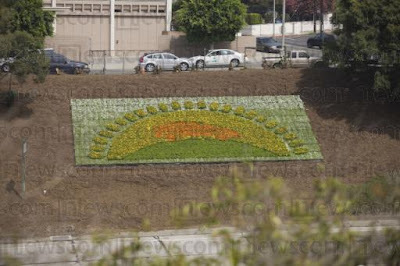 The display is made up of more than 20,000 live flowers and yesterday Mayor Antonio R. Villaraigosa unveiled the 'Harmony Floralscape' on the side of the Pasadena Freeway (SR-110) in downtown Los Angeles. This is one of nine oversized floral designs that will appear alongside California freeways with seven Harmony Floralscapes planned for the Los Angeles area and two in the San Francisco area. - the west side of the Pasadena (110) Freeway, just north of the 101 Freeway. - north side of the Ventura (101) Freeway, west of Balboa Blvd. -south side of the Foothill (210) Freeway, at the Los Robles Ave. on ramp. - north side of the Junipero Serra (280) Freeway at the Winchester Ave. exit in Santa Clara County. The Harmony Floralscapes are highlighted on the Toyota Prius Facebook page and also publicised on the main Toyota US site. These displays are an innovative use of outdoor and mark the continuation of a series of interesting initiatives to promote the 2010 Prius.